Stone statue of a lion. Hamadān (anc. Ecbatana), Hamadān province, Iran. Late fourth century BC? L. ca. 3.40 m, D. (head) ca. 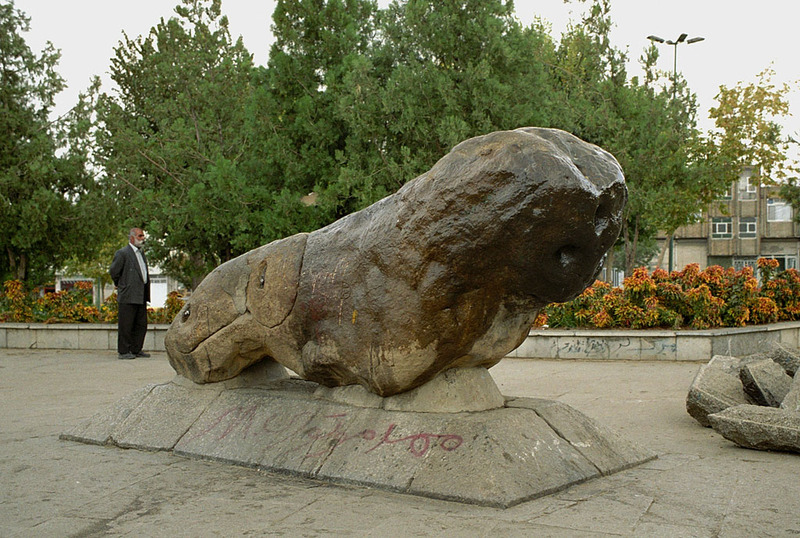 1 m.
The battered life-size sandstone lion, after which the Sang-e Šīr ('Stone lion') hill in the southeastern part of the city of Hamadān has been named, figures prominently in the local lore (Jackson 1906: 159-160; Nadjamabadi and Gropp 1968; Mousavi and Encyclopaedia Iranica 2003: 612-613). According to the tenth-century geographer and historian Abu’l-Ḥasan ʿAli b. Ḥosayn al Masʿudi, the lion was fashioned at the order of Alexander the Great upon his return from his campaign in Ḵorāsān, India and China(! ); and it stood initially, as a guardian of the city, near the western gate (Bāb-al-Asad or 'Gate of the Lion') of Hamadān, on a hilltop overlooking the main ancient thoroughfare leading from Mesopotamia to Central Asia (al Masʿudi, Moruj al-ḏahab wa maʿāden al-jawhar, sections 3592-3594, see Nadjamabadi and Gropp 1968: 126-127). The century-earlier geographer Ebn al-Faqīh al Hamadānī refers to the same statue as a work of the 'Roman' (Greek?) sculptor Balinās. This time, the lion is said to have been fashioned at the order of the legendary king Qobād; and to have been meant as a guardian against floods and the city's customary severe winter cold (al Hamadānī, Aḵbār al-boldān, pp. 240-241, see Nadjamabadi and Gropp 1968: 124-125). Early modern commentators variously considered the colossal lion a creation of the Medes (Flandin and Coste 1851: I, 389; cf. Jackson 1906: 162 and Ghirshman 1954: 116), who had made Ecbatana the capital city of their kingdom (e.g., Hdt. 1.98), or a possible imported work of the Parthian period (Herzfeld 1941: 290-291). The closest parallels for its form are generally held today to be found in fourth century Greek sculpture — an interpretation that makes it possible to link the statue's origin with events connected with the campaign of Alexander the Great in Persia. 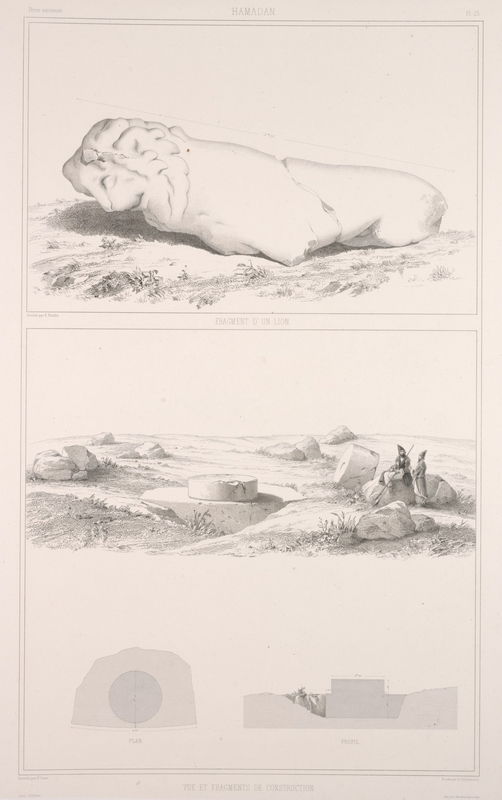 Leaning to the view that the Hamadān lion was originally depicted in a seating position (Flandin and Coste 1851: I, 389; Jackson 1906: 161; Herzfeld 1941: 290), in his detailed study of the statue Heinz Luschey (1968) pointed in particular to possible similarities with the lions of Chaeronea and Amphipolis on the Greek mainland. He further proposed tentatively that the statue could belong to a cenotaph erected by Alexander the Great for his companion Hephaestion, who died in the course of games held at Ecbatana in 324 BC, but whose actual resting place was Babylon (Arr. Anab. 7.14.1 and 5; Diod. 17.110.8; cf. Plut. Alex. 72). In this case, we would be dealing with a rare surviving instance of a sculpture commissioned by Alexander himself in Iran. 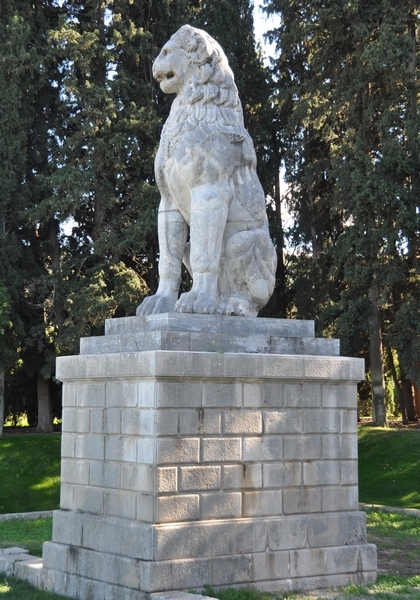 Lately, Olga Palagia posited a closer similarity of the pose of the Hamadān lion with that of crouching lions commonly used as markers of fourth-century BC Attic graves. In her opinion, the Hamadān lion also most likely marked an actual grave. This grave could belong to Alexander's general and treasurer in Media, Parmenio, who was assassinated at the order of his king shortly after 330 BC but was subsequently honorably buried at Ecbatana by the Macedonian army (Palagia 2012: 370-371, with the relevant ancient testimony). Information about the original archaeological context of the statue is irrevocably lost. Soundings conducted by Charles Fossey in the vicinity of the lion in 1913 yielded no further ancient remains (Chevalier 1989: 247). Chevalier, N. 1989. 'Hamadan 1913. Une mission oubliée.' Iranica antiqua 24: 245-253. Flandin, E. and Coste, P. 1851-1852. Voyage en Perse … pendant les années 1840 et 1841. Paris. Herzfeld, E. 1941. Iran in the Ancient East. Archaeological Studies Presented in the Lowell Lectures at Boston. London, Boston, New York. Jackson, A. V. W. 1906. Persia Past and Present. A Book of Travel and Research. New York and London. Luschey, H. 1968. 'Der Löwe von Ekbatana.' Archäologische Mitteilungen aus Iran 1: 115-122. Mousavi, A. and Encyclopædia Iranica 2003. 'Hamadān vii. Monuments.' Encyclopædia Iranica, vol. XI: 612-615. An updated version is available online at http://www.iranicaonline.org/articles/hamadan-vii (accessed on 6 March 2012). Nadjamabadi, S. and Gropp, G. 1968. 'Mittelalterliche arabische Quellen zum Löwen von Hamadan-Ekbatana.' Archäologische Mitteilungen aus Iran 1: 123-128. Palagia, O. 2012. 'The impact of Alexander the Great in the art of Central Asia.' In Stoneman, R., Erickson, K. and Netton, I. (eds. ), The Alexander Romance in Persia and the East. Ancient Narrative, Supplementum 15. Groningen: 369–382.